You’d think given its name, The Cosmopolitan of Las Vegas would be the place to go for a Cosmopolitan cocktail. And while, yes, you can order this rose-hued classic at any of the Strip resort’s numerous bars and lounges, there’s something we’ve discovered through tireless, potentially liver-damaging research: The Cosmopolitan’s upscale watering holes and vanguard restaurants offer myriad intoxicating takes on another timeless cocktail: the Old Fashioned. There are debates about the Old Fashioned recipe that will never be settled, like water vs. club soda or muddled fruit vs. whole fruit (still water and no muddling for Mercer), but the immutable facts of the Old Fashioned are simply that it must contain spirits, water, bitters and sugar–except when it doesn’t. 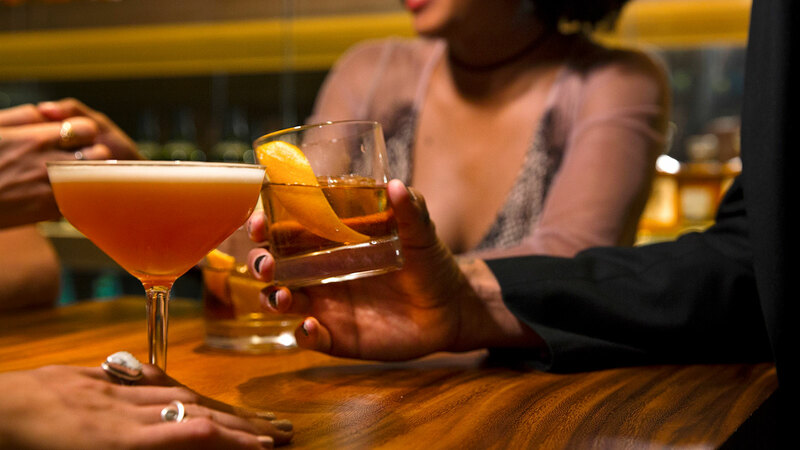 Momofuku is known for Chef David Chang’s crave-worthy multicultural cuisine, but it’s also a powerhouse when it comes to lascivious libations. The restaurant’s Bonji Old Fashioned is almost too smooth for its own good–or, really, for the drinker’s own good, because you’ll go through these quickly if you’re not careful. You might be asking yourself “what the heck is bonji anyway?” It’s a cold-pressed liquid seasoning derived from fermented rye grains. Think soy sauce, only way less salty and way more exotic. This helps give the Bonji OF a unique, slightly smoky finish. Handcrafted cocktails may not be the first thing that comes to mind when one thinks of The Henry, which is probably better known as a spot to get comfort food favorites any time of day. But, folks, we’re here to let you know that The Henry’s cocktail program is as impressive as its brioche French toast is delicious, and the 24-hour diner’s Comedy of Errors, is (80) proof of that. Mixing bourbon, fig and cinnamon syrup, and Aztec Chocolate Bitters, this update on the Old Fashioned is as strong as it is smooth, with very subtle chocolate notes. We’ve talked before at length about zuma’s Japanese whisky program, so it should come as no surprise that this izakaya-style restaurant’s take on the Old Fashioned is a favorite. zuma keeps it simple, just Suntori Toki whisky and a proprietary blend of bitters and simple syrup, chilled by a hand-cut, zuma-stamped ice cube, and garnished with a fire-branded grapefruit peel. As far as our taste buds are concerned, there’s no need for anything more. Except maybe a second helping. Some people might say using anything other than bourbon in an Old Fashioned is blasphemy. To that, we say: You haven’t tried the Oaxacan Old Fashioned at Beauty & Essex. Named for the Mexican state where mezcal flows through the streets (or so we hear), this cocktail mixes a triple-threat of Oaxacan Old Fashioned Sauza 901 Silver Tequila, El Silencio Mezcal, and Ancho Reyes Chile Liqueur with lemon-thyme, Angostura and chocolate bitters, and a splash of orange oil. It’s surprisingly easy to drink, with a slightly citrus top and smoky overtones—and no sign of the usual tequila burn. Blue Ribbon’s Old Fashioned Beginner’s Luck keeps things traditional, combining rye whiskey, bitters and cherry cordial with a single, large ice cube for a smooth, classic flavor that pairs well with the restaurant’s eclectic menu—although the New York import mixes things up by serving the drink in a tall glass. That said, its cocktail menu cousin, the Country Lawyer, is slightly more interesting, stirring its bourbon with Benedictine & rhubarb amaro. We recommend trying both, mainly because we’re bad at making decisions. The “original” in Original Sin is the operative word. It’s more of a new fashioned, the Jaden Smith to the Old Fashioned’s once-radical-now-bankable-star Will—but with a less confounding Twitter presence. Start with an hourglass-shaped tumbler and perch in the narrow part a Chinese-spiced sphere of frozen simple syrup. Decant from your sidecar a blend of whiskeys, including cinnamon and pecan, and let the magic happen. Sweet and spicy, the Original Sin is the kind of cocktail that demands to be sipped by a fire on an autumn night—or while surrounded by The Chandelier’s shimmering crystal curtains. Best of all, as the ice sphere melts, more simple syrup is released into the drink. Meaning this little darling turns into its own dessert. It’s alchemy of the finest kind. R.R.L. Old Fashioned | Rose. Rabbit. Lie. When you’re settling in for a psychoreactive freakout like OPIUM, you need the steady hand of the familiar to lean on. The R.R.L. Old Fashioned is maybe the most traditional offering on this list, with Four Roses bourbon, demerara syrup and Angostura bitters serving as the guides on the well-trod path of your taste buds’ memory. But there’s just enough of a twist in Laird’s Applejack–a gorgeous spirit with a long history and a bare hint of apple–to keep things spicy. The Italians have a saying: “Throw a bunch of herbs in a bottle and see what happens.” At least we assume that’s a saying. If nothing else, it explains the proliferation of delicious amari all over globe. Turns out it’s a fantastic addition to an Old Fashioned, too. This variant uses Amaro di Angostura and Amaro Meletti to bring the bitter, while The Cosmopolitan’s own select barrel of Knob Creek holds down bourbon duty. Sweetened with Old Time Rock & Roll Syrup that infuses coco chai tea into simple syrup, you’ve got yourself a robust tipple with the broad, almost vegetable notes for which amari are famous.